I've been so excited for this bronzer. I absolutely adore Mac bronzing powders, they're my go-to because you can rely upon them to never make you look orange. 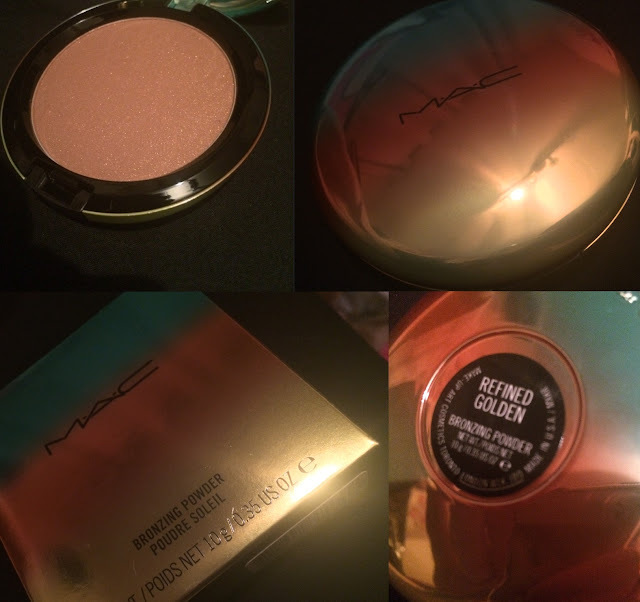 As soon as I saw the photos of the Mac Wash and Dry Collection, I knew that I'd have to try one of the bronzers. I was debating for a while over the Matte Bronze shade or Refined Golden but I do like my bronzers with a bit of glitz so I went for Refined Golden. Although this bronzer did not quite live up to my full expectations, it's a great product and I will get a lot of use out of it. The reason why it doesn't live up to my full expectations is because it isn't as pigmented as I had hoped for, and a lot of the glitter falls out during the journey from pan to brush to face. Despite this, I do love the colour and I will use it a lot. It's a beautiful product but you do need to swirl your brush around quite a bit to get a good amount on there. I recommend this if you love shimmery, golden bronzers and want to try something from the Wash and Dry Collection. There are bronzers that are much more pigmented from Mac though so if pigmentation is a big issue for you, go for a different one.